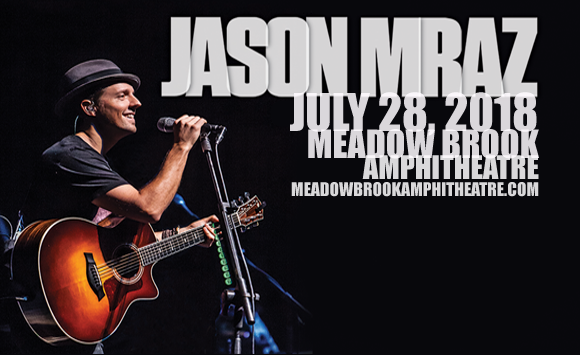 With his upbeat, conscious grooves, internationally renowned singer-songwriter Jason Mraz comes to Meadow Brook Amphitheatre on Saturday 28th July 2018, as part of his aptly titled Good Vibes Tour! Spreading the love, and promoting his hotly anticipated new album, Know, Mraz will be joined for the evening by fellow singer-songwriter Brett Dennen in support! Jason Mraz is a two-time Grammy Award-winning singer-songwriter who came to prominence in 2002 with his major-label debut album Waiting For My Rocket to Come. His following release, Mr A-Z (2005), peaked at number 5 on the Billboard 200 and sold over 100,000 copies in the US. Mraz's 2008 hit “I'm Yours”, from the album We Sing. We Dance. We Steal Things (2008), introduced him to an international audience. The song peaked at number 6 on the Billboard Hot 100, giving him his first top ten single, and spent 76 weeks on the chart – a record at the time. To date, Mraz has sold over 7 million albums and has earned Platinum and multi-Platinum certifications in over 20 countries. His upcoming album, Know, is due for a 2018 release.